The Trofeo Princesa Sofia Iberostar on Mallorca is looking to be one of the most popular events of the 2019 season with a record 1225 sailors from 67 nations registered this year. This 50th edition kicks off the European season on Monday 1 April and for many of the competitors it will be an importent event in the selection process for Tokyo 2020. 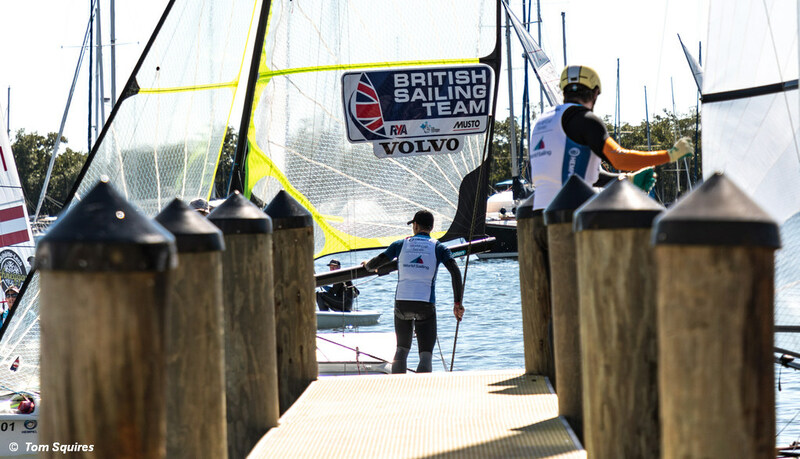 For the British Sailing Team (BST) it is the first of a number of ranking events leading to the selection of entries for the final Tokyo 2020 test event in August 2019. In the Finn class Giles Scott is the odds-on favourite and winning in Miami added to his status, but for this final spin of the Olympic rings for the iconic class, he will face some very strong opposition. Internally Scott faces Ed Wright, Henry Wetherell and Ben Cornish in the battle for Olympic selection. In addition the Palma fleet will include three medallists from the Olympic Classes World Championship held last summer in Aarhus. Hungarian sailor Zsombor Berecz claimed gold ahead of Swedish competitor Max Salminen, who won silver by two points ahead of bronze medallist, Dutch sailor Pieter-Jan Postma. Also competing will be Nicholas Heiner who recently beat Scott in Melbourne. In the 49er, where Sime and Mihovil Fantela will be the hot team, the British number one pair Dylan Fletcher and Stuart Bithell will continue their battle with James Peters and Fynn Sterritt as front runners for the Team GB spot. Returning to the international circuit are 2016 Olympic winners Pete Burling and Blair Tuke, beaten back home at the recent NZL Nationals event, but you can be sure they will be in the final mix here. In the women’s 49erFX the Brit selection race is coming down to Charlotte Dobson and Saskia Tidey needing to get a consistent performance ahead of Sophie Weguelin and Sophie Ainsworth. Out front should see current class World champions Annemiek Bekkering and Annete Duetz from the Netherlands, and New Zealand’s Alexandra Maloney and Molly Meech. For the BST the two 470 classes are looking locked-in, with Hannah Mills and Eilidh McIntyre in the women hard to dislodge, but in the men’s event Luke Patience and Chris Grube are finding it hard to justify a third run at the Games. Ai Kondo and Miho Yoshikoa from Japan, Silvia Mas and Patricia Cantero from Spain will be podium favourites for the women, plus Mills and McIntyre. While Mat Belcher and Will Ryan from Australia or Spanish sailors Jordi Xammar and Nicolás Rodríguez will head-up the men. The men’s Laser is another event where the BST top spot looks to be under pressure. Double world champion Nick Thomson is facing a strong squad challenge from Elliott Hanson, Michael Beckett, Lorenzo Chaiavarini and Jack Witherell. Overall this looks wide-open with a 190 strong fleet in Mallorca to add to the pressure. In the women’s Radial Alison Young is going for a third Games and will face considerable pressure from Hannah Snellgrove and Georgina Povall. Overall the favourites are Dutch sailor Marit Bouwmeester and Belgian sailor Emma Plasschaert, the current class World champion. In the foiling Nacra17 the Brits have a very strong squad, headed by Ben Saxton and Nikki Boniface, with John Gimson and Anna Burnet, and Chris Rashley and Laura Marimaon challenging for Team GB selection. Ruggero Tita and Caterina Banti of Italy, the 2018 European and World championships will be favourites along with the Aussie pair, Jason Waterhouse and Lisa Darmanin, and not forgetting Argentina’s Lange and Carranza Saroli. And on the boards, Bryony Shaw continues her come-back season in the women’s RS:X, but finding it difficult to find a way past the youngsters, Emma Wilson and Saskia Sills. In the men’s RS:X event it is all up for grabs in the BST, with Kieran Holmes-Martin, Tom Squires, Andy Brown and Dan Wilson still to put down a real marker for the selection. The big fleet racing at the Princesa Sofia regatta is unlike the World Cup events and the Olympic Games, where entry is restricted to just one competitor per nation, per event. While other Olympic events can have several competitors from the same nation on the podium, in sailing you get just one chance of a podium place, putting a lot of pressure on the national selectors to get it right. Time is short and after Mallorca it will be a round of European Championships and World Cup events leading up to the final Tokyo Test event in August. The RS:X, 470, Finn, Laser, Radial, 49er, 49erFX and Nacra 17 all face class championships before the end of May. Later in the year their will be a number of World Championships, but for the Brits selection could be done and dusted well before then.